1959 – Santa’s Village opened to the public on Memorial Day weekend. 1962 – The park undergoes an extensive expansion program that will add notable attractions such as the Polar Dome Ice Area, the Snowball Ride and the expanded magic train ride. 1963 – The Polar Dome opens. 1965 – Santa Village Corporation announces a pending sale of the park to Everding Management. 1966 – A storm with high winds rip open the Polar Dome roof. The Dome is replaced with a flat roof. Holland also created his own line of branded products. Storybooks, puzzles, and coloring books could be bought at the park as well as in stores through out the region. The Santa’s Village candies were sold via mail order. Santa's Village is the name of several theme parks in the U.S. states of California, Illinois, and New Hampshire, in addition to one in Ontario, Canada. As of 2007, only the theme parks in New Hampshire and in Ontario remain open. Of the theme parks, only the Santa's Villages in California and Illinois had common ownership. Santa's Village (Illinois) in East Dundee. Closed in 2006. Santa's Village (San Bernardino County, California) (1955-1998). A theme park built in 1955 by Glenn Holland in Lake Arrowhead. Closed in January 1998. Santa's Villlage (Santa Cruz County, California) (1957-1979). A theme park built in 1957 by Glenn Holland. Closed in 1979. In the year 1989 the city of Scotts Valley, California produced a Redevelopment Plan to re-use this site for new uses. Santa's Village was a major San Bernardino Mountains tourist draw in its day, but it couldn't survive societal changes. Copyright, 2006, the Los Angeles Times. Reprinted with permission. In its heyday, Santa's Village was one of Southern California's biggest tourist attractions — a place to catch the holiday spirit even in July. It opened on Memorial Day weekend 1955, more than a month before Disneyland. But after 43 years of delighting young and old in the San Bernardino Mountains, the 15-acre elfin theme park — with fanciful, life-size gingerbread and doll houses, a candy kitchen and a toy shop — fell on hard times and closed in 1998. Over the last nine years, the log cabins of Santa's Village have deteriorated, becoming a veritable ghost town. Its parking lot was used for a jazz festival and by locals for sledding and snow play until it became a way station for bark-beetle-infested trees on their way to a sawmill. But Santa's Village isn't forgotten. "The Arrowhead Chamber of Commerce still gets calls to see if it is still open," said J. "Putty" Putnam Henck, 88, a retired general contractor who built the park on land his family owned. Henck's links to Southern California extend more than a century. His father, Joseph, was born in Los Angeles in 1888. "He was kind of a jack of all trades," Henck said in an interview. "He mined the platinum and gold for his future wife's wedding ring and ran a mercantile store at 6th Street and Broadway, called Henck and Martinez." His future wife, Mary Putnam, was born in Wisconsin and arrived in Los Angeles with her family in 1890. A 1903 graduate of UC Berkeley, she taught school in Los Angeles and later became the first female vice principal at Manual Arts High School. "She was six years older than my father," Henck said. "My father always told me that women his age were too stodgy." Their first child, "Putty," was born in Los Angeles in 1918. That same year, they paid $10,000 for 440 acres in the San Bernardino Mountains, planning to build a resort someday. In the 1920s, the Henck family moved to an orange ranch in Hemet. "My mother helped start the first Ramona pageant in 1923," Henck said. They moved to the mountains in 1923, to the future Santa's Village property. Henck's mother had one demand: that their home have running water. "It had water," Henck said. "But no electricity." In the area of Lake Arrowhead known as Skyforest, the elder Henck began subdividing 160 acres for development. With a pick and shovel and the help of a few locals, he built a water system and roads. He also opened a general store selling everything: nails, bread, even dynamite. "He also became the area's first fire chief and insurance agent," Henck said. "My mother was the first postmaster." Mary Henck also opened Lake Arrowhead's first schoolhouse, with 13 students. Today, Lake Arrowhead intermediate school carries her name. Henck went to his mother's alma mater, UC Berkeley, and earned a civil engineering degree. Later he married and moved to the San Bernardino area, where he worked as a general contractor. In 1953, Southern California developer H. Glenn Holland proposed Santa's Village after reading a Saturday Evening Post story about a similar project called North Pole in New York, Henck said. Holland set up a corporation that funded the amusement park, and the Henck family leased the land to Holland. Holland opened two more Santa parks in the United States — one in Scotts Valley near Santa Cruz and the other in Chicago. Both are closed. Putty Henck brought in a crew to build the 15-acre park on 220 acres of family land. Trees cut to clear the land were used to build the fantasy log cabins with rooftops covered in fake snow, giant candy canes, candles and gingerbread men. When Santa's Village opened six weeks before Disneyland, Henck said, "traffic was backed up all the way down the mountain." At first, the park was open year-round. During most of its life, it was open weekends for nine months, closed April, May and June, and open full-time during the Christmas season. It had kiddie attractions, including a small bobsled, a monorail, a petting zoo, a wishing well and chats with Santa. Young and old alike enjoyed the enticing aroma of gingerbread wafting from the bakery, as well as visits to the dollhouse, candy kitchen, toy shop and live reindeer. In 1978, the original group of investors went bankrupt and the Henck family took over. Henck, by now the family patriarch, and his wife, Pamela, were determined to turn the mom-and-pop park around. They left San Bernardino, where they had lived for 25 years, and moved into his parents' Skyforest home. The whole family and a few investors pooled their money to buy the park. Henck handled maintenance and finances; his wife wrote scripts for the puppet show, hired performers and handed out lollipops to the children. Other Henck family members worked at the park too. "It never really made any money until my wife and I took it over," Henck said. "A television commercial is what brought people up here. And we added a merry-go-round and Ferris wheel and other rides." Children loved the Magic Train ride down Storybook Lane, which included painted characters in scenes from the Old Woman's Shoe, Humpty Dumpty, Jack and Jill and more. The park drew nearly 180,000 visitors a year, Henck said. But in the 1990s, the recession took a toll. Then Pamela Henck died after a long illness. "It was an end of an era," Henck said. "The young generation began to over-program their kids to where they had so much stuff to do, and not enough time for a four-hour or longer round-trip drive up the mountain." Santa's Village closed in 1998. Three years later, the 220-acre property sold for $5.6 million to Thomas Plott, owner of Plott Family Care Centers in Riverside and San Bernardino. Plott planned to reopen the park. He refurbished some of the buildings, but that's as far as he got. "Plott died last year, and all the buildings have been left deteriorating," Henck said. The park's movable goods were sold at public auction. Today, the pastel-colored toadstools, Santa's sleigh, giant candy canes and a clock with months rather than numbers decorate homes and stores in and around the mountains. But Henck doesn't seem nostalgic — not even on Christmas Eve. "I don't dwell on the past," he said. "When it's over, it's over. It was fun at the time." The publicity surrounding the building of Disneyland sparked ideas in many an entrepreneur’s head during the fifties. 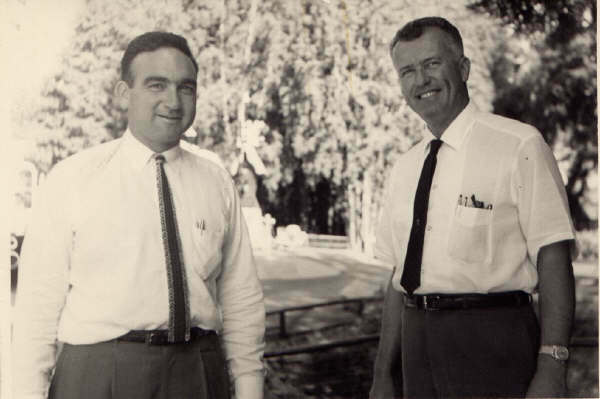 By 1955, the year Disneyland opened for business, H. Glenn Holland had already opened the first of what would become a chain of three Santa’s Village amusement parks at Lake Arrowhead in Southern California. Meanwhile, the success of a local builder’s temporary Santa’s Wonderland in Scotts Valley the winter of that same year convinced Holland that this area could support a second Santa’s Village. Acquiring the polo pony farm previously owned by golf pro Marion Hollins, Holland began plans for the park to be located on the east side of highway 17 as it passes through Scotts Valley. Santa’s Village opened Memorial Day of 1957 complete with winter-themed rides such as the spinning snowballs, a mirror-maze, puppet shows, a petting zoo, and of course Santa’s house complete with a refrigerated “North Pole.” All the buildings in the park featured high peaked roofs with artificial snow and icicles, even the gas station out front was adorned in this fashion. Employees were garbed in curled toe elf costumes, in the case of Santa’s helpers, and lederhosen for ride attendants. Certainly that was no fun during the hot summer months. Over the years various promotions were tried, including the addition of exotic animals and local celebrity guests such as Captain Satellite, Smokey the Bear, and Romper Rooms Miss Nancy. The first and favorite Santa was Denmark native Carl Hansen. 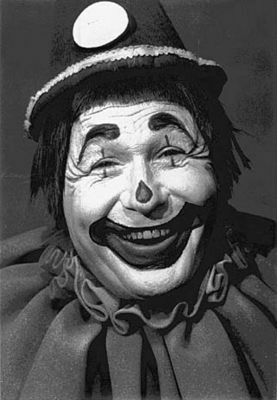 He played Santa at the park for five years then left for television to become the clown Hocus Pocus. Alas, the park had a hard time competing with Santa Cruz Boardwalk, a mere ten minutes down the road. Santa’s Village Corporation filed for bankruptcy in 1977 and the property owner took it over in an attempt to run the park profitably. In 1979 the park closed for good. Equipment was sold off, the snowball ride was converted and is still in use at the Boardwalk, but the buildings remained. The site sat deserted for some time, teenagers up to no good who climbed the fence were the parks only visitors. Eventually the land was sold and is now the site of high tech firm Borland International. Thanks to Carolyn Swift, Santa Cruz historian, for information contained in this article. Skyforest first resident was Adam Kuffel. In 1923 Joseph and Mary Henck purchased property in the area, and were the prime movers in the development of this area. Mary was an educator and has a school in the Lake Arrowhead area named for her. This book follows the life of the Henck family, who moved to the san bernardino mountains in 1923. They established schools, organizations and santa's village. Author Putnam "Putty" Henck brings to life the hardships, accomplishments and character of this famous family. Christmas Kids - a delightful website full of historical information about Christmas.